We don’t know exactly why Rudy felt compelled to ask a Gideon for a copy of God’s Word last month. But he did. And that question launched a discussion that would be the most important conversation of Rudy’s life. The Holy Spirit was working on Rudy’s heart. As the young man listened to the Gideon sharing the Gospel, he realized just how lost and hopeless he was without Jesus. And in the moments to follow, Rudy made the life-changing decision to follow Jesus and to make Him the Lord and Savior of his life. We give God all the praise for Rudy’s testimony. We thank our members, donors and others whose faithful prayers and financial support made it possible for Gideons to be there that day with God’s Word. 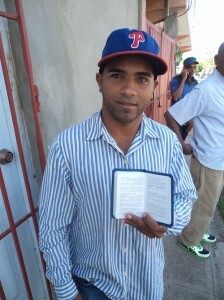 Because of so many faithful Christians and a faithful God, Rudy can now experience just how much God truly loves him. Hello. I am glad to hear that there is proof of what I have believed. There are so many out there seeking,searching for the truth. In a world full of misinformation,lies ,and misdirrection many people are on a quest for answers to fulfill that need that God Himself has placed into all of our hearts. Where is the love,what is love,where can I find it? There is only one source! god and His Word. As Faith Fund Chairman of my Gideon Camp I always read a International testimony at each of our camps Saturday morning prayer meetings and our monthly Camp meetings. This was not always the case, but since we started to read a International testimony our giving has increased considerably. There is something about hearing the encouraging testimonies of real people that makes our Gideon Brothers want to give. If I am reminded, I willingly give. If I am not reminded, I seem to forget the importance of the Faith Funds needs. It’s sort of “out of sight out of mind”. Not every Gideon reads the the info on line or the letters sent from the International. I encourage all our Faith Fund Chairman to read a testimony at each meeting. They will be amazed at the results. Eye hath not seen nor ear heard what God has in store for those LOVE Him.